I took a few pictures of my Dragon before packing it up for BrickWorld. As with many of my models it doesn't really photograph very well. Overall I'm happy with the results. I had fun working at this scale and it gave me a greater appreciation for those who do such detailed minifig work. Thanks for the feedback on it earlier you guys. I think it turned out much better because of the suggestions. Same picture as above but larger. This is very well done. 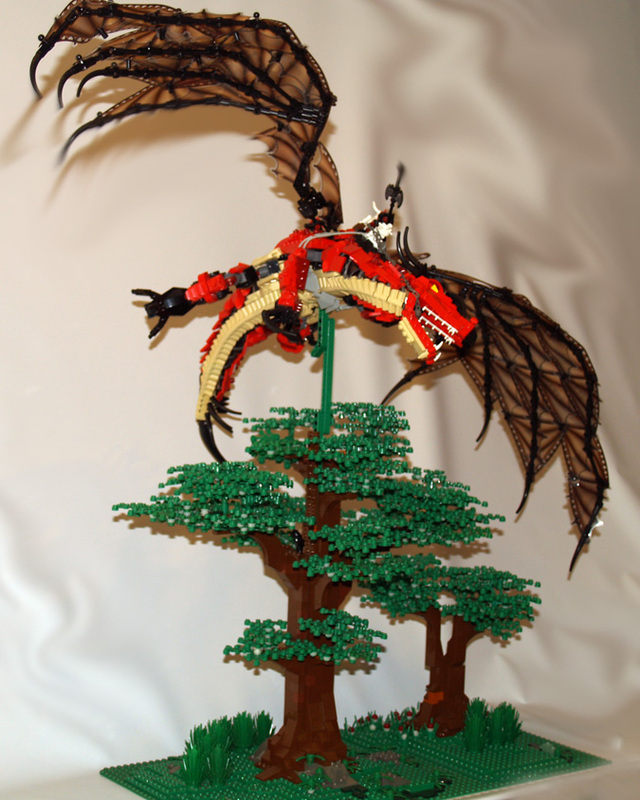 The trees are simple but well executed, and the dragon has a lot of ferocity dripping from every inch. My only complaint is that the close up of the dragon is a bit blurry. Anybody get the license number of that red flying gator??? Pretty impressive monster you got there. 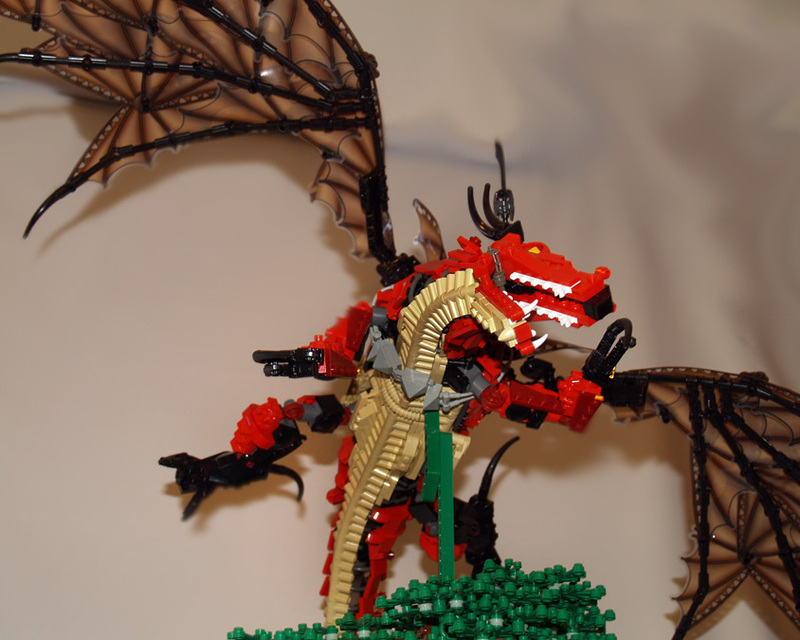 Beats the snot outta my puny LEGO green and black common variety dragons. Very nice. Have you posted it before? I should like a more detailed study of it. Chicago is inconveniently located for me on the west coast, or I would see it up close. I envy people who can build such good BBBs. 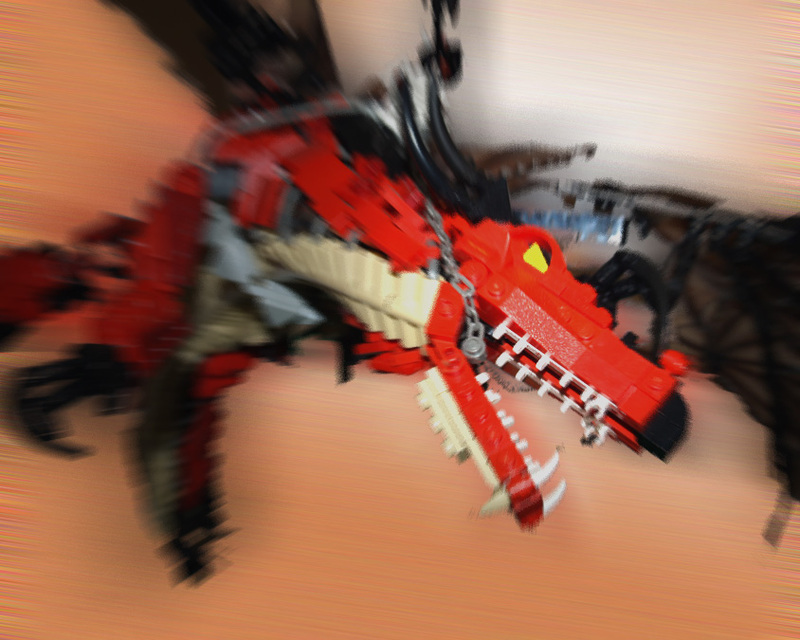 Brick Built Beasts. 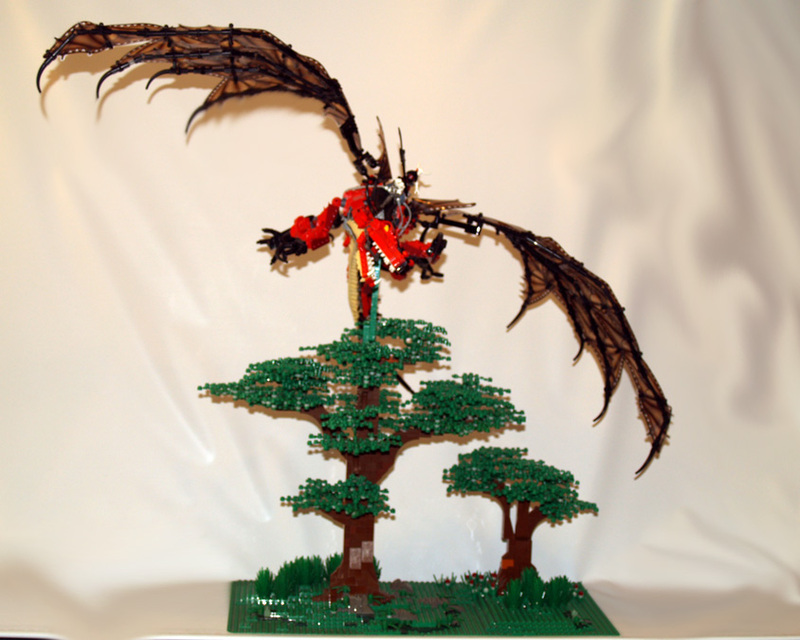 Beautiful trees and absolutely fantastic dragon. The construction on both is just perfectly done. 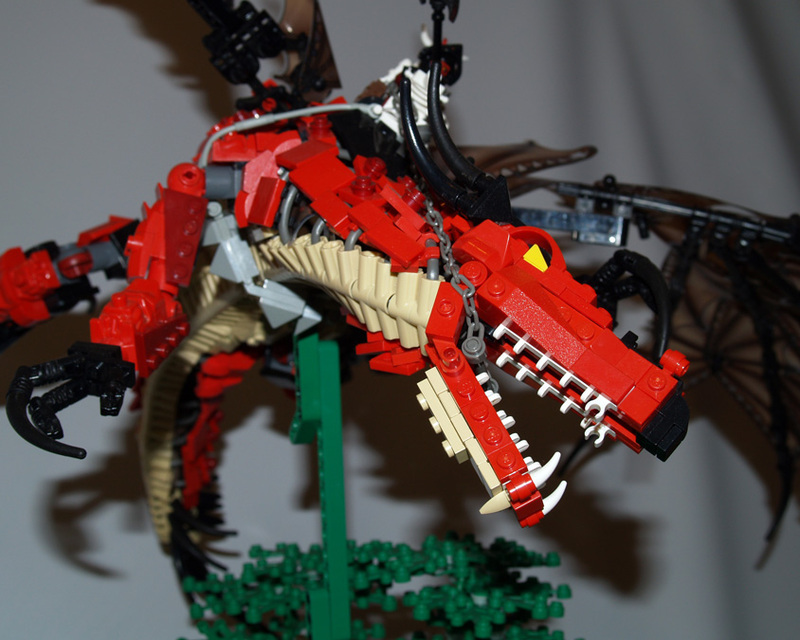 I'd say you're definitely a master when it comes to building creatures with bricks. Head ... exploding ... trying ... to take in ... the full ... awesomeness ... of the wings! I like the row of tan technic angle connectors you've used all along the belly. Gives it a very bony yet strong/armored appearance. If he doesn't rip you apart with his teeth or claws, he'll simply crush you with his weight. The wings are also very well done! I like what you did with the belly as well. Seeing all those bone outline makes it look so cool! I am seriously blown away. Incredible! The thing I find most impressive is the fantastic pose you've got him in, but I have to say the thing I actually like the most is the teeth! I like this a lot. The underbelly is done very well. I have seen that use of the ninja sings before but it is very effective. Keep up the good work. The retouched photo alone was worth blogging. I think photographing anything that big is going to be a challenge. Nice work. The technic belly is well done, and I like how it provides connections for the flexible rods onto which the back's scales are clipped. I've always wondered how to created a good scaly look in a model. The wings are superb! I like the head and the body. A very vicious yet sleek design makes this a great creation to look at. Kudos for a well made creature!